Perfect for large families of all ages is this sprawling renovated Queenslander on an enormous parcel of land all within 10 kilometres of Brisbane's CBD. 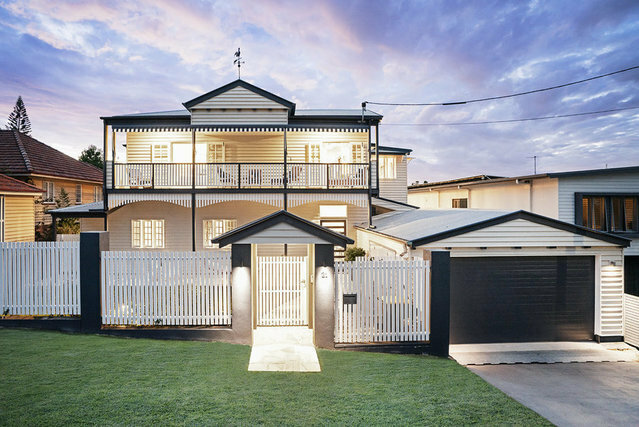 Elevated on a peaceful leafy street, one of this friendly suburb's best, the character 1920s double-storey home has been redesigned to accommodate contemporary living. According to CoreLogic research, 21 Weal Avenue is the only residence in Tarragindi offering six ensuited bedrooms each with a walk-in wardrobe as well as 6 car accommodation. City views, a gymnasium, fully-equipped bar, impressive outdoor entertaining zone and heated swimming pool barely scrape the surface of this immense property package. A welcoming sense of warmth and personality has been retained during an extensive update which has enhanced traditional features including VJ walls, polished timber flooring, door handles, architraves and skirting boards. Modern comfort is unquestionable with the likes of ducted air conditioning, solar power, intercom security, travertine tiles, Zip Tap, Italian tapware and marble benchtops. The heart of the first floor of this double-storey home is the spacious country-style kitchen with Miele and Ilve appliances, custom-made timber cabinetry, six-burner gas stovetop with built-in deep fryer, and a walk-through pantry. Large shared living spaces nearby include a living room, sunroom, dining room and lounge, while one of the two bedrooms sharing this floor is the beautiful master bedroom with balcony access. Spoilt for choice, the ground floor contains a media room, office and living room opening to the aforementioned outdoor entertaining terrace, bar and pool. This inner-city family estate is a rare combination of size, style and convenience; a home to enjoy with loved ones for years to come. Access the CBD via safe designated bikeways or it's an easy 12-minute drive by car, while there's also bus stop at the end of the avenue. Walk to popular Esher St Café & Deli, parks, the local footy club and medical centre. Surrounded by bushland and forest yet so close to the city, it's little wonder this pocket of Brisbane has one of the highest owner occupancy rates.